Do you ever sit down to blog without a clue of what you’re going to write about? Yeah, me, too, sometimes. But not nearly as often as I used to. I have been doing a lot of organizing lately. Perhaps it’s the whole back-to-school thing. You know, that time of year when you go buy shiny new office school supplies for yourself, err, kids. Along with cleaning out closets, sheds and the scary basement store room, I decided it was time for me to really evaluate my website. I drifted off a bit during the summer and let my writing wander to parts unknown and somewhat unfocused. But now I’m getting back on track. I’ve been brainstorming and planning and working on a new blogging schedule. Of course, it’s still a work in progress, but getting organized always helps me be more creative, as counter-intuitive as some of you think. One of the tools that really helps me to get organized and stay organized in my blogging is an editorial calendar. Being able to look in one place to see what I’m publishing and when I’m publishing it, helps me stay focused on my work. I actually have a couple of different editorial calendars and I use them differently. The first is the “Editorial Calendar” plugin for WordPress. It’s free and it’s easy to use, especially for a one-author blog like mine. The Editorial Calendar plugin is just what it says. Once you install it, you’ll find it under Posts in the left-side menu. 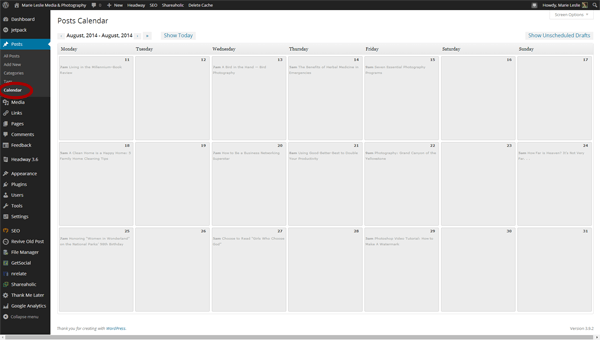 When you bring it up, it looks just like a calendar, showing what you have scheduled and when it will publish. You can change the publishing date on items just by dragging them to another spot on the calendar.Before they make it to the editorial calendar on WordPress, though, they first have to make it through my idea file and on to my sticky-note board. My idea file is a notebook that I carry with me pretty much everywhere. Whenever inspiration strikes, I jot it down in my notebook. I also use it for brainstorming, for working out new ideas and for keeping notes on meetings and phone calls. If I decide that a blog post idea has merit, I start writing the post and I add it to a white board next to my desk. 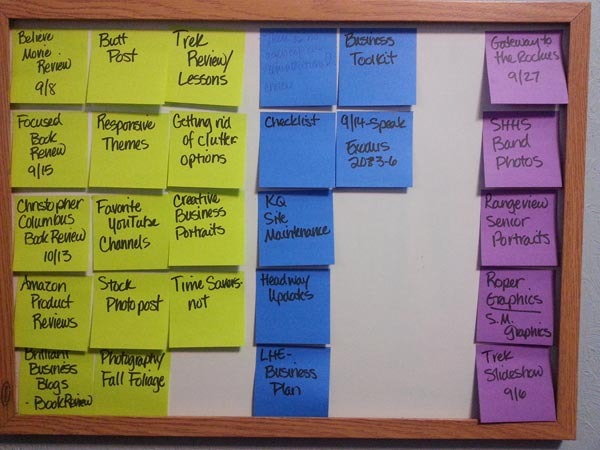 I use sticky notes to organize my blog posts as well as other tasks and assignments for my business on the white board. I color code them by type of assignment–as you can see here, my blog posts are green, photography is purple and media jobs are blue. This board makes it easy for me to see at-a-glance what I have coming up and helps me to keep from overloading myself. In theory, I can use it with Evernote. Yes, I do use Evernote, too, but mostly just to bookmark all the blog posts and websites I haven’t had time to read yet. I love that it works on my home office computer, my office computer, my ChromeBook and my phone. I am NEVER without reading material now. Some blog posts get dates on the board–that’s because some posts (mostly reviews) have to be published on specific dates. Others won’t get assigned a date until I finish writing them and actually put them into WordPress. And now that you know the best tools to use for organizing your editorial calendar, here’s a great infographic from Bonnie and Company at Hobby to Hot with some great ideas to really get your Editorial Calendar going. I was going to write about all this, but since she’s already done the work and is gracious enough to share, why reinvent the wheel?